I first came across Chiddy Bang on Pretty Much Amazing after they created a remix for Gorillaz's Stylo and then some time passed and they dropped their most recent mixtape "Air Swell" and after hearing that tape I knew these guys were a group to watch. From rocking electronic beats that sample MGMT, Kate Nash and Kid Cudi to rock legends like Radiohead (Check out the track "Because" below), Chiddy Bang are quickly gaining popularity amongst the Interwebz. 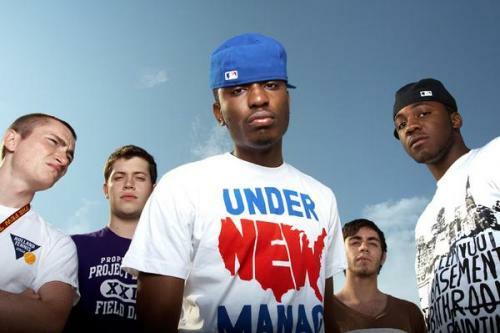 For those that don't know, “Chiddy Bang is a four piece hip-hop/electronica outlet from Philadelphia. Currently attending their first year of college, they posses a musical maturity that is far superior to the teen-pop cliche. Chiddy Bang blends hard hitting lyricism from front man Chidera “Proto” Anamege, original electronica afro-beat and jazz influenced production from keyboardist Noah Beresin and drummer Zach Sewall, and additional production and vocals from guitarist Pat Braz.” Frontman Proto reminds me of a mix of Gym Class Heroes' frontman Travis McCoy, The Cool Kids and Wale, which is dangerous. Check out some of their unreleased tracks below and their mixtapes, "Air Swell" and The Swelly Express and expect more of them on the blog.